George Wilson: A Thanksgiving hero – Live! Starring ... You! George Wilson talks with LSY! teen reporter Amelia Gilmer from Mount St. Mary Academy about his motivation for giving back to to the community. George Wilson is many things: pro football player, rising model and actor – and a caring citizen. 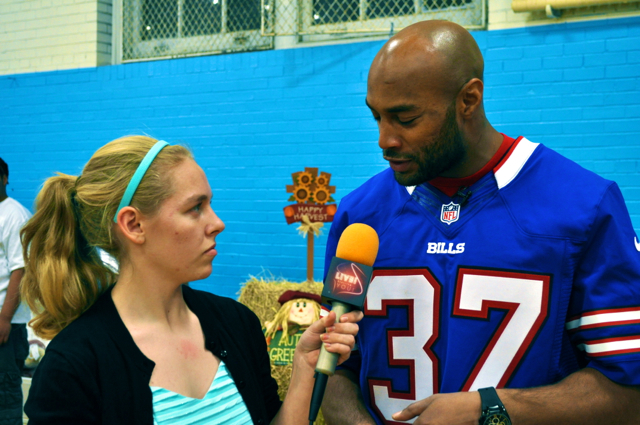 For three years, George has hosted a Thanksgiving food basket drive as a way of giving back to the less fortunate citizens of western New York, where he plays safety for the National Football League’s Buffalo Bills. The organization provided dinners boxes and turkeys to more than 150 families. In addition, the SAFETY program works alongside other organizations such as Toys for Tots to give back to the children in George’s Kentucky hometown, and with groups that are focused on lowering the number of high school drop outs. George feels that it is his duty as an athlete to help out those in need, not only by donating time and food, but by being a good example in the community. George especially cares about being a hero for children, who look up to him. Because of his job, people are always watching what George is doing and even emulating his actions. “I want the eyes to be on me for something positive,” he says. George doesn’t do this for personal recognition, but because he feels that it’s the right thing to do. He continues to influence and shape the Buffalo community and make it a better place for everyone. If you were in the spotlight, as George Wilson is, would you choose to be a positive model for others?